Live Exports Exposed – Archive (1995) Film by the ACIG Showing British Calves Exported to Europe. This is old footage; fortunately it does not happen this way now, or does it ?? UK: Foie Gras Is Produced to Lower Animal Welfare Standards Than the UK has; So Post Brexit, A Ban on Foie Gras Imports Into the UK Is Possible. The Wallace Collection and Skylon restaurant at the Royal Festival Hall have become the latest London landmarks to withdraw foie gras from their menus thanks to pressure from our #FoieGrasFreeGB campaign. They join the Tate Modern who made the same compassionate choice just two weeks ago. Our campaign continues, and we were encouraged to see that Kerry McCarthy MP and Neil Parish MP have recently proposed amendments to the government’s Agriculture Bill. These amendments would mean that animal products produced to lower standards than UK animal welfare law dictates could not be imported here, effectively banning foie gras from being sold in the UK. We need your help to ensure this succeeds – please contact your MP and ask them to support these amendments to the Agriculture Bill. It only takes a few minutes to do this using the website www.writetothem.com and we’ve included a template message below to make things even easier for you! I am writing to ask for your support for Amendments NC1 and NC4 to the Agriculture Bill. When the UK exits the EU, it is essential that we do not allow cruel products like foie gras or animal products that are produced using methods that would not be allowed under our animal welfare laws to be imported from other countries for sale here. This would completely undermine the UK’s current legislation and us as a nation of animal lovers. As my representative in Parliament I implore you to vote for NC1 and NC4 during the Report Stage of this Bill. 1) The castration without anesthesia for the piglets extends for two years in Germany. The politicians have promised, it should be officially practiced the castration with anesthesia from 1.1.2019! 2) Everyone who films undercover torture and animal cruelty in laboratories and animal farms will be treated as criminals in the future! So say the politicians who are responsible for these grievances. And the press brings the rain on us: No one is allowed to play the checker in the stable! 3) The animal transports remain unlimited in Europe and everywhere! So have decided the EU politicians who are responsible for the welfare of the animals. And the press brings the rain on us: Animal transports are subject to rules and regulations that must be respected within the EU! The list is still long and it will rain again! EU / Japan Trade Deal: More Whale Killing ? – Take Action to Stop It. Your last chance to say ‘NO’ to EU/Japan trade deal – act now! Next Tuesday (11/12/18) , MEPs will vote on a free trade agreement with Japan. We need them to say ‘NO’ to this deal unless Japan stops killing whales. You have one last chance to make your voice heard. Please send a message to your MEPs and ask them to vote ‘no’ to the deal on Tuesday and to raise Japan’s whaling as a serious issue in the EU Parliament debate on Monday. our voice counts – act now. This year alone, Japanese whalers killed 503 minke whales and 134 endangered sei whales. The Japanese government is trying to overturn the ban on commercial whaling and disregards any rulings by international bodies against its brutal slaughter. The EU should not enter into a trade agreement with a country that shows such contempt for international agreements and opinion. Your voice really does count. If enough MEPs say ‘no’, we could stop the deal. But they need to know it’s an issue you care about. Please don’t just leave this for others to do. Ask your MEPs to raise Japan’s whale hunting as a serious concern and vote ‘NO’ to the deal next week. Thank you. We’ll only stop this horrific and senseless slaughter by standing together. Send a message to your MEPs. It’s very easy! Enter your postcode at writetothem.com. Choose to send a message to all your MEPs (if you have more than one). Write and send your message. If you receive a response, please let us know at notradedeal@whales.org. Raise whaling as a concern during the debate on Monday. Vote ‘NO’ to the trade agreement on Tuesday. Tell your MEPs why this is important to you and why you think that the EU must use this opportunity to get tough on Japan’s continued slaughter of whales. Even if the deal is signed, this is our chance to send a strong message to the Japanese government that we are sick of its defiance of international agreements and opinion. It also keeps the fight against whaling high on the EU agenda. Even if signed, the trade agreement can be used to pressure Japan to stop whaling. Below – how it should be ! 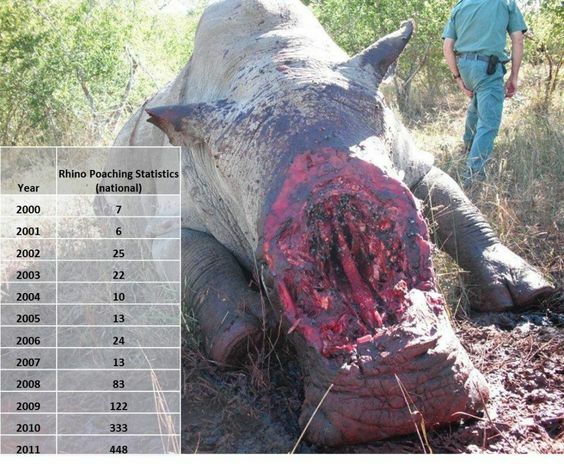 The Reality of Rhino Poaching. Horn may have been hacked out whilst the poor animal was still alive. Photo is not good but sometimes we need to show these images just to get the reality home to people a bit more. It is the same with Elephants – taking tusk is not a clean procedure.